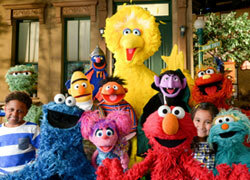 Discussion in 'Classic Sesame Street' started by ssetta, Apr 27, 2003. I was at Best Buy the other day, and they have a whole bunch of TV series being released on DVD. These include Friends, The Simpsons, South Park, and many others. It's like you can buy 7 seasons of each series on DVD. And they will come out with more and more. Now I think they should do that with Sesame Street as well. That is, a DVD series of every episode of Sesame Street that has ever been made. It would have all 4000+ episodes. What do you think? It'll never happen. We can dream, but then we face reality. I think it will happen soon. I think they'll do it. Even if it takes 10 20 years I think it will happen soon. Not to mention. Any ways if they don't they'll end up putting old episodes on DVD. not all the of them but they'll put some out on DVD. There was this petition to sign that how many there was they would put some episodes on a DVD. So don't be down Ssetta about what Manofthestreet said be happy and keep dreaming and hoping and maybe it will come true some day. Hope everyone of ya'lls have a Sunny Day. Thanks. I agree with John. Its just not possible. Not to mention there is no production company on earth who would be willing to make such a large set. If it didn't sell to their projected intake, they'd basically be throwing money away. Not to metion the fact that, I don't know about you, but I don't know what I'd do with a 1000-DVD set. If you think about it, you can fit about 4 episodes to a DVD (3 is a more practicle number, but I'll stick with 4). So, do the math. Now you might say to yourself "shut up pal, I'll make room for my 1000 DVDs!". Alright, so I guess that means you are willing to pay the $15,000 the set will cost, huh? If the average DVD costs $15, and the production company puts it out as such, you're looking to spend more than certain people make in a year. So, as sorry as I am to say this; dream on, folks. A dvd does not take 4 episodes. It can take more. look at the Simpsons, Friends adn Futurerama. Friends has 6 episodes on each disc. Simpsons has like 4 or 5 and Futurerama has 3 on one disc and 4 on the other. Now I understand that there are 4 or 5 on the Simpsons and Futurerama but there's 6 on each of the Friends DVD's. So If anybody knows how many episodes were proudice in the first Season of Sesame Street. Then If anybody knows I'll add to see how many might be able to go on a SS DVD and then will see who's spending to much money. Thanks. Hopefully my ideas will make some sense ... the only purpose I see for a Sesame Street episode DVD project is to raise MORE money for PBS, Sesame Workshop, or Noggin, or whatever. The way I picture it, there would be a catalogue that lists each episode, along with its description/lessons. The customer would fill out the order form and say which episodes they wanted to see (with a limit of four or five per order). No one would be crazy enough to want to see ALL 4000+ of them, so they'd just pick out the ones they thought looked the most interesting (Big Bird's Insomnia, SS Goes To Prison, etc. ), or the ones that would be most beneficial to their family (#1839), or the ones they remember most, and of which they want to relive their memories. The episode DVDs would be treated with care like food at a (good) restaurant ... they wouldn't be made until they were ordered, because no one wants to go to the trouble of making them all at once (see above posts). If the project were treated with the kind of care it deserves, they'd take a shorter time to make the DVDs than A&E did with the FREAKIN' BIOGRAPHY DVD THAT TOOK FOUR FREAKIN' MONTHS TO REACH ME!! .... whew, excuse me, just lettin' off a little steam. Plus, the more orders they get, the more money they'll get, and the more DVDs they'll be able to make and sell, and badda bing! It sounds like I'm going overboard, but hey, I've made SOME sense, haven't I? Oh, and for the record - I think a single DVD would only fit TWO SS episodes. I agree that a Best Of would be more practical. Aside from the volume of 4000 episodes, they re-use so many clips you'd end up with a whole bunch of copies of say "The Alligator King". Lord knows I'm sick of seeing the same Elmo's Worlds over and over again just on the episodes I have on tape. They should have the "landmark" episodes available.....Mr. Hooper's death, Luis & Maria's wedding, Snuffy revealed, etc. I have to agree with you there, Cookiefan. I mean if Timelife can do a "Best of" series with the Muppet Show, they can surely do one with Sesame Street. I'd like to see the early episodes that aired before I was born. 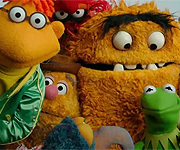 Though, Muppet Cenral Radio plays quite a few songs and sketches from the earlier shows. That sort of gives me an idea of how it was like. Besides, even if there are six episodes on a Friends DVD, you have to remember that each Sesame Street episode is twice as long as a sitcom episode, and when you factor in the fact that sitcoms have commercials, Sesame Street is almost three times as long. I agree, it's just not practical. It was a nice thought, though. Yeah there is obviously no chance at all of a complete show set, or even a season by season set - just wouldn't sell. However a best of disc, or maybe some epsidoes being available on 'Video On Demand' or as someone else mentioned, services like 'DVD On Demand' which may well come out in stores in the future - things could be possible on a smaller scale. Henson themselves have looked into putting classic Muppet stuff out on DVD and through the sales research they didn't think they could sell even a thousand of them. Usually the lowest runs of DVD's would be 10,000 to 15,000 at the very least for someone specialist like Time Life but usually much more for retail stores, into the many hundreds of thousands. Another thing to remember is that Friends or The Simpsons are 30 minute programs whereas Sesame Street is an hour per episode. The popular sitcomes are produced in huge numbers which makes their cost per disc go down dramaticly. Two-three episodes per disc is the most you could realisticly expect. Rather than an episode-by-episode 10 or 20 disc set, I would prefer having a DVD set that contained chronological sketches of particular characters. For example, have a DVD with a hundred or so of the Classic Ernie and Bert Sketches. While fans would love something like this, it may not be practical for the average consumer. A "play all" button would be a must though. Maybe have a special intro and then the sketches one after another with titles and original airdates, then a comprehensive credit list at the end. We may see a Sesame Street DVD boxed set at some point in some form, but don't expect it to be more than 10 or 20 discs tops. It just won't be bigger than that most likely. Something like this might come out around the season 40 celebration in five years or so. Though a concern I would have about a "best of" video is that they might be tempted to stick with their current video format: some kind of weird plot-line that introduces each clip. I'd rather have entire episodes with their original format. Heck, it's been on for 30 + years, why not a 34-disc set with the best two episodes from each year? I was thinking one new intro at the beginning with the characters, then the clips one-after-another. A new intro before each clip would get old. I wouldn't want this like the "Best of Ernie and Bert" video, but rather clips in their entirety shown one after another with titles and original airdates shown before each clip. You see, I just happen to like a lot of the songs and sketches that were never very popular to begin with. It would be wonderful for something like that to happen, but for some reason, I don't think it will. Maybe a "best of" series, but it probably wouldn't have the stuff I want. I mean, Noggin never did a very good job with the Unpaved series, as I have mentioned before. There was an awful lot of stuff missing. Like episode #560 with Sally the Astronaut, and if you have seen episode #1316 where they go to Puerto Rico and surprise Maria for her birthday, I think they actually did a whole bunch of remote shows that season, but Noggin only picked the one. Maybe it could have more than the Unpaved series, but a lot of those shows had segments that were never very popular, but I like them. Like Hawaii, they spent a week in Puerto Rico if my memory serves correctly. Sorry I forgot that Sesame Street was an hour long. So every- ones right. That would be better. I was thinking that How about a series of each of the old clips. I think they should do this take 10 episodes from each season or 5 which either would be simple. And make a series out of that. Or take each cartoon clip and make a DVD out of that. Then and so on. Like Phillip said make a DVD with each Erine and Bert skit. Then have one with all the songs of Sesame Street. Sorry for the camostion. I'll remember next time not to start somthing that I can't remember. Thanks and Sorry. So here's a new idea 46 DVDs: one for each letter of the alphabet, and one for numbers one through twenty - you might even be able to group them in threes and have only 16 DVDs. Each of these could be organized by animator or star (muppet.) You could include on-the-street segments, too. Gee, I wish we all worked at the Workshop and could actually make these ideas happen! Well... dispite the fact that SW would rather make money off of little kids with Elmo's World and (Ick) Dragontales DVD's, and once again, to heck with collectors and fans over 5 years old, I'd personally stick with the classic skits, "Best of" series. Maybe even a lost characters DVD with Don Music and Little Jerry! Just out of interest, you USA guys seem to be talking about 10 disc, 16 disc, 40 disc and 100 disc sets like they are actually kinda happening. Whats the largest disc set you've seen in the states ? The most we have is like the X-files which is 6 or 7 - maybe it's a Uk thing and we're behind the times but i can't even contemplate a 40 disc set of anything right now - maybe in five years time yeah but wow, it's being talked about like it's normal. True, but how many of those shows have aired for 30 years?